Paint several empty toilet paper rolls and set them aside to dry. Next, cut each roll into several discs. 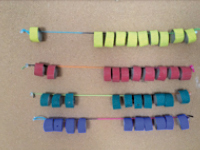 Using thumbtacks, arrange a few long pieces of colourful yarn horizontally on your bulletin board to represent the sliding wires of a traditional abacus. Slide cardboard discs of a single color onto each piece of yarn. Children will love sliding the discs from left to right and counting them for fun. Invite children to help you paint or color several empty toilet paper rolls. Using a hole-punch, make two holes at one end of each cardboard tube. 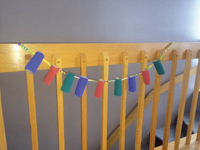 Thread a long piece of colourful ribbon through the holes, letting the cardboard tubes hang vertically to create a pretty garland that can be hung within your daycare or in your yard to celebrate a special event or activity. Give each child a flattened empty toilet paper roll. Show them how they can cut a slit diagonally at the top and the bottom of their toilet paper roll (placed horizonatally) at either end to create a simple bow. Let children decorate their bow as they wish. When they are done, help them wrap a piece of pretty ribbon around the centre of their bow. 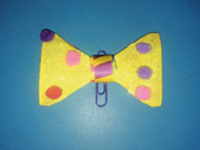 Boys can use a paperclip to wear their bow as a necktie. Girls can slide their bow onto a headband or glue it on a piece of pretty ribbon to wear it in their hair. 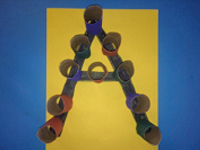 Show children how they can arrange empty toilet paper rolls vertically on a table or on the floor to represent the letters of the alphabet. With very young children, trace the letters on colourful construction paper and encourage them to position the empty cardboard tubes on the lines. Have fun naming the letters with the children in your group. Cut several empty toilet paper rolls into discs. Paint half of the discs with red poster paint and the other half with blue poster paint. Let dry. On a table, use electrical tape to trace a line in the centre of a rectangular or square table. Divide your group into two teams and invite the children from each team to stand at one end of the table. Deposit the blue discs on one side of the line and the red discs on the other side of the line. Show children how they can use their fingers to slide their team's discs across the line as in the traditional pinocchi game. The goal of the game is to have as many discs as possible on the other team's side at the end of the game. Each game can last one minute. When the time's up, count how many discs are on each side of the line to determine a winning team. You will need a lid for a large cardboard box. Set it upside down on a table. Arrange several empty toilet paper rolls that have either been painted or decorated with stickers horizontally inside the lid. Use hot glue to keep them in place. Show children how they can deposit a marble in the lid and tip it back and forth to make the marble roll through the tubes. Use feathers, glitter, stickers, etc. to decorate several empty toilet paper rolls. With a hole-punch, make a hole at one end of each tube. Thread a tiny bell onto the end of several ribbon pieces and insert one piece of ribbon inside each tube. Use different lengths of ribbon to hang the tubes from a clothes hanger and hang it in a tree in your yard. The tiny bells will produce a light sound as they move in the wind. Inflate several bright balloons. Let children draw on them or decorate them with stickers. 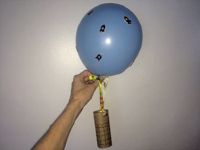 Position an empty toilet paper roll vertically under each balloon. Use a hole-punch to make two holes, one on either side of the upper section of each tube. Thread a piece of ribbon through each hole and attach the other end of each ribbon to the balloon. The cardboard tubes will represent hot air balloon baskets. On a windy day, take your miniature hot air balloons outside and watch them float away. Certain children dislike getting their hands dirty. They can even refuse to participate in activities to keep their little hands clean. This is true, among other things, with sidewalk chalk. Show children how they can slide a piece of sidewalk chalk inside an empty toilet paper roll to hold the pieces of chalk without getting their hands dirty. At the end of the activity, simply discard any damaged cardboard tubes. Take several empty toilet paper rolls outside and show children how they can use them to capture ants, ladybugs, and caterpillars by depositing the toilet paper rolls around or in front of the insects. Children will have endless fun with this simple activity.